Spiderwort, Tradescantia virginiana, a spring-blooming flower with long, strappy leaves, is a very hardy North American native perennial that is widely grown for its weeks-long bloom period. Spiderwort has a kind of messy, grass-like form punctuated with quarter-sized flowers that last only one day. Luckily each plant produces many of them, in a leisurely succession. As the petals fade, they become almost translucent, giving them their other common name, Widow's Tears. Leaves: The blade-like leaves are lanceolate and grow to 12 inches or longer. Flowers: The 3-petaled flowers are most popular in clear blue, but there are varieties that bloom in white, pink and purple. They tend to close in the afternoon sun and only last for a single day. Hardiness Zones: Spiderwort is reliably perennial in USDA Hardiness Zone 4 - 9. For the most abundant blooms, plant your spiderwort in full sun and moist, well-draining soil. If you can't provide moist soil, you will have better success if you plant them in partial shade. You will sacrifice a little blooming, but you'll barely notice. Mature spiderwort plants reach a height of 12 - 24 inches and spread to 18 - 36 inches. They are generally divided before the plants reach 36 inches in width because they can start to die out in their centers, however, you can let them fill out and form a nice mass planting. You will get a good 3 months of blooms (May - July) from your spiderwort plants. No deadheading is necessary to get this repeated blooming. However, spiderwort does tend to self-sow enthusiastically. If you are worried about them self-seeding too aggressively, you can shear the plants back after their last flowering, so that they do not have a chance to go to seed. Seeds for Tradescantia will most likely come in a mix of colors. If you want a specific color, you will probably have to purchase plants. 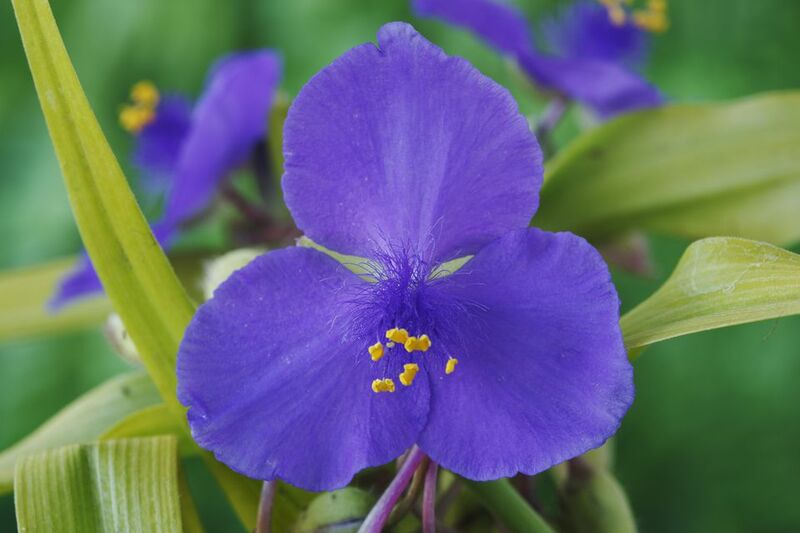 Most of the Tradescantia plants available in nurseries are cultivars of Virginia spiderwort. Plant breeders have really been focusing on leaf color and the contrast of leaf and flower color. Tradescantia "Amethyst Kiss": The purple-blue virtually glow when the sun hits them. Tradescantia "Concord Grape": Pinkish-purple flowers are set against blue tinted leaves. Tradescantia "Red Grape": Bright rose-colored flowers are offset by silver shimmered leaves. Tradescantia "Sweet Kate": Has bright yellow leaves that contrast well with the clear blue flowers. The major drawback of spiderwort is its tendency to look ragged after its bloom period. Since it is an early bloomer, pair it with plants that will distract, but complement. The wide leaves of Heuchera and Bergenia are good choices. If you are growing your spiderwort in partial shade, primrose makes a good partner. Although spiderwort will tend to fade into the background after blooming, let them shine in spring by using them as edging along paths, in the cracks of stone walls or massed as a groundcover under trees. A favorite use is to allow it to naturalize in a woodland setting. Soil: Spiderwort prefers a slightly acidic soil pH, in the 5.8 - 6.8 range. Planting: You can start with plants or seed, but not all cultivars are available from seed. Start the seed indoors, in early spring. Barely cover the seed with soil and be sure to keep it moist. Seed should germinate within 2 - 3 weeks. Move seedlings into larger pots and slowly harden off, before transplanting outdoors. Spiderwort plants will self-seed freely, sometimes to the point of becoming a nuisance. They are easy to pull out and a good shearing once the plants have finished flowering, will cut back on the spread of seed. These plants are also easy to propagate by division and you can do this in either the spring or fall. Dividing and replanting them in the spring will give them plenty of time to reestablish. The main effort required to grow spiderwort will be a mid-season shearing. This serves 2 purposes. First, it prevents them from self-sowing and becoming weedy. Secondly, spiderwort declines considerably in the heat of summer, after flowering. Shearing the plants back by 1/3 or de-leafing to new growth will reinvigorate the plants and make them look a lot more presentable, for the rest of the season. There are a few leave spotting diseases that can befall spiderwort, but they are not the norm. The biggest pest will be snails and slugs, that enjoy the same moist soil spiderwort prefers. Young plants are most susceptible. Otherwise, spiderwort is virtually pest free and deer resistant.